Love With Food helps you discover new organic, all-natural snacks delivered to your door every month. Their subscription membership starts as low as $10/month. Every month, Love With Food members will receive a curated box of unique, hard-to-find tasty snacks which varies based on seasonal themes. For every box sold, we donate a meal to several food banks such as the Feeding America Network and Share Our Strength - No Kid Hungry. Join them to help end child hunger one meal at a time! Say goodbye to boring grocery selections and start discovering your Love With Food experience! Get twice the snacks, Give twice the meals! As low as $17 / Month. 16-20 new snacks each month. Each box donates 2 meals to hungry children in America. Snacks are either organic, all natural, GMO-free, gluten-free or free of artificial junk. My "Flavors of the World" box contained Cassava Chips by Wai Lana, Shortbread Fingers by Walkers, Earl Grey Tea by Taylors of Harrogate, Ginger Chews by Chimes, Lollipops by Pierrot Gourmand, Taco & Burrito Seasoning by Desert Gardens, Pasta Chips by Vintage Italia, Chai Spice Macaroons by Emmy's Organics, InkaCorn by InkaCrops, and White Miso Soup by Sushi Chef. Prepare your taste buds to tour the globe with Love With Food! Once again I'm very impressed by the design and presentation of the Love with Food box. The Love With Food Box is one of the coolest subscription boxes around - it's got all-natural and organic snacks, a varied and fun selection, great curation, and they donate a meal to a food bank for every box or item you purchase! 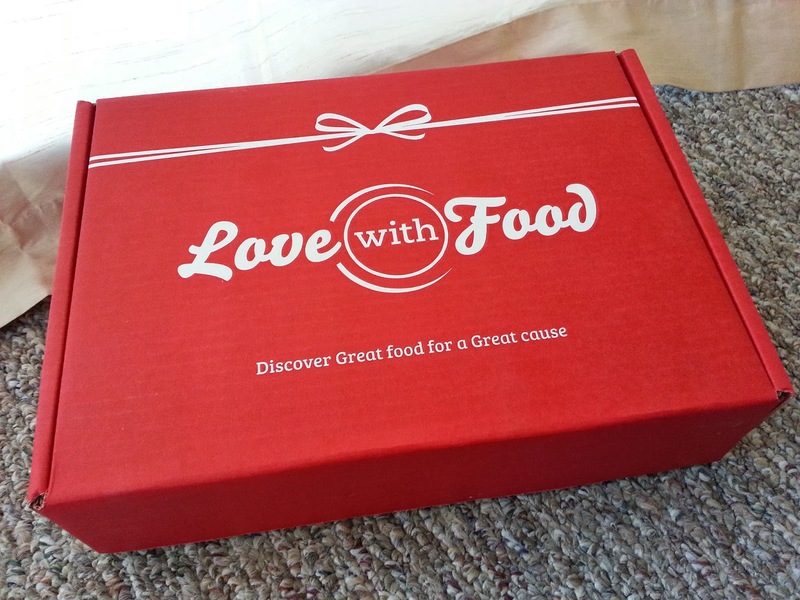 Love With Food is giving one of my lucky followers a 1 month Deluxe Box subscription!! One (1) winner will receive: A 1 month Deluxe Box subscription to Love With Food. Ends 4.9.13. This looks really interesting. I'll have to check it out, since my son has food allergies I don't know if it will work for us. I love monthly subscription boxes. I would probably love the variety of treats inside. Great giveaway! I love how they donate meals...so cool! Great giveaway! It is really nice that they make a food donation with each purchase. It seems as though subscription boxes are becoming more popular. This looks like a great box. I love these subscription boxes where you get to try new things each month. I would like to try the Macaroons and the Lollipops. I like that they are organic. What a fantastic subscription box! These are so fun. Like a new treasure delivered every month. I love Love with food! They are a great company with a great cause! I said it before and I will say it again, I am all about helping other countries but it's about time someone did something to help ours!!!! Great review!!!! I love their cause. How they donate a meal for every box you buy. This is such a great idea! I love helping people. I love that it's all organic!! I love that they give food away! I love the variety and ability to try new stuff... and that they donate! yummy now this is what i call getting good mail. Off to check them out. Such a neat idea & awesome way of giving back to a great cause!! I love this! never heard of it but I like to try out new food all the time lol! My favorite thing about Love With Food is that their snacks are organic. I love getting to try food that I can't find in my local grocery store. I like all the unique flavors offered. It would be great to win this giveaway! I love that you can discover healthy and good food every month! My favorite thing is that they donate a meal to a hungry child in the USA with purchases. congrats to the winner! the box is full! Looks like a very nice subscription company! SO many of them give you a nice sized box. . . with only like 5 things that barely fill the box halfway. Congrats to Erika T.!